The Bosphorus can be a total dream or a complete nightmare, depending on how you experience it. Every day hundreds of thousands cross it to go to work or travel, thousands sail under it carrying cargo or tourists..Every night, boats sail all around it showing avid diners the wonders of its shores, giving them an unequaled experience. My family and I went through that same kind of unequaled and unforgettable experience. It was my fathers birthday on Saturday and my mother had stumbled upon an offer from the ever so insta-famous website SehirFirsati.com who specialize in last minute offers for every city that they are based in. After making up her mind, she thought that it would be lovely to spend the night on one of those boats, accompanied by the lovely “Suzanne Kardes” – who’s voice and songs could melt the coldest of hearts and turn you into a total bundle of joy. We immediately called the boat to make reservations and they told us that we didn’t need to bother ourselves with buying our tickets on the fantastic portal that is SehirFirsati, but that they would sell us said tickets directly from the boat, just to make our life easier. My mother agreed and off we went to celebrate my fathers 66th birthday on the “Nis 2” boat hosted by the Feraye company – as strongly recommended by Sehir Firsati. Let me just say that living in Istanbul makes you ready for any kind of chaos that could be sent your way. It doesn’t matter how small or big the deed, if it involves chaos and you’re an Istanbulian, chances are you’re ready to tackle that son of a gun and pulverize it. I wasn’t ready for this experience though..
After boarding the ship, and being greeted by a large group of people trying to get their ticket from two guys who were standing around a table at the front of the boat, we waited 20 minutes to be able to get our tickets and be seated. Another specification that I need to make before I forget is that my mother had especially requested not to be seated under or next to any speaker because she didn’t want us to suffer from temporary hearing loss. I will let you guess where we were then seated. Right under them nasty speakers, the kind that would wake the dead and make them complain to the human rights commission. And amnesty international. I kept my cool. I swear! When I asked to speak to the manager, I was as cool as an iced puppy. Cross my heart. After waiting 20 additional minutes for the manager and not seeing anyone coming our way I decided to go directly to the mountain myself. I went back to the front desk equipped with the tickets that we were given and requested to speak to the manager. I was then shoved towards a lovely man who seemed to be either working the scene, or the PR manager. He then told me that he would deal with the situation immediately and he decided to seat us in the VIP section of the boat, which is situated right next to the band and artist. Sounded like a great plan! It was perfect! My parents would surely enjoy THAT! That’s what I felt until I saw the table. Guess where it was situated? Next to a speaker. At that point I had really given up on arguing with anyone and had decided to keep my cool even furthermore. The table had been used by other patrons who had decided that they wanted to eat under speakers so there were used plates and glasses and crumbs all over the table cloth. Mr PR person requested that the table be cleaned immediately by one of his minions. His staff was running left and right portraying the reaction a crowded group would have if an enraged bull was heading their way so they weren’t really ready to add some extra work to their load. We waited an extra 25 minutes before someone came anywhere close to our table to clean it from the waste and equip us with clean utensils. First they removed the dirty plates. Then they removed the dirty glasses approximately 10 minutes later. After a failed attempt at placing the new dishes of meze onto the dirty cloth, they had to remove that too, under my mothers watchful eye. The Turkish starters weren’t all that bad. They looked terrible because they had obviously been waiting outside the fridge for a while but the taste was alright and we’re all still here, so no one died (that I know of). While we were eating the meze, the live band started and soon after Suzanne Kardes came along. If it weren’t for her I don’t think the event would’ve been bearable at all. If you want to have a wonderful evening accompanied of Turkish songs and beautiful Turkish music, do not hesitate to check her website to glance over at her list of appearances (she’s soon to appear at a Kurucesme Arena concert.) You will not be disappointed! The main course, which was fish, arrived approximately 1 hour after the band started playing. By then everyone was very intoxicated due to the heavy drinking of free alcohol and not a lot of attention was given to the main course which was either fish or red meat. Thankfully, I don’t drink alcohol so I was alert enough to see that the fish was dried when grilled and ended up being rather tasteless. It was all down hill from there on..The desert was four pieces of fruit thrown onto a huge plate (just to make them look very miserable) and to top it off, the boat ended up dropping us off one hour late to Arnavutkoy. To sum it all up, do we like the “Nis II” events? God no. Will we ever join another one? Not unless I’m at gunpoint. Did Suzanne Kardes and her folkloric songs gain another fan? Indeed they did. Do I still like Sehir Firsati for proposing such a horrid experience? The jury is still out on that. My advice is to double and triple check the events you buy. Hopefully I’ll be changing my mind on them soon and we will be friends again. 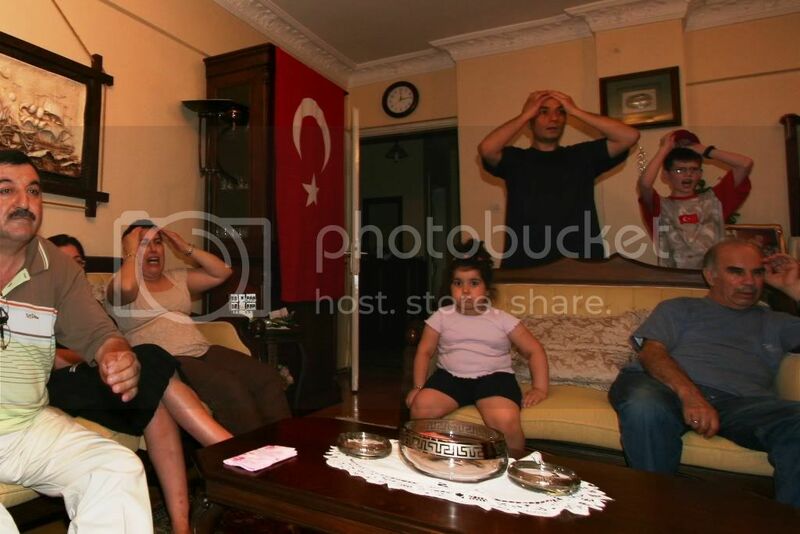 All great things must come to an end…and so Turkey bows out of the Euro 2008 gracefully and proudly. I decided last night that I would stay above the fray and wouldn’t mention, or even hint at the disgraceful conduct of the officiating team in their refusal to call fouls against Germany. So if you are looking for someone to agree with you and say that there was an obvious bias against Turkey, you won’t find me giving it any airtime…even though your thoughts are well developed, perfectly justified and deserve to be heard. I simply won’t lower myself to the level of the officiating team. Now, if you were to press the point and force me to express my thoughts on this, of course I would agree with you, in fact, I couldn’t agree with you more than I already do. However, I am determined to stay far above that type of base Monday-morning “quarterbacking” and simply accept this for what it is…a great run to the semi-finals by the finest team in Europe or Asia. As one of my dear Turk brothers said….S’tan, it is enough that we made it to the semi-finals…let’s thank Allah for that. What a graceful answer to a disappointing event. I will bow to Ernest Thayer and his great words to bring closure to this years amazing, but disappointing run. No stranger in the crowd could doubt ’twas Casey at the bat. “That ain’t my style,” said Casey. “Strike one,” the umpire said. And its likely they’d a-killed him had not Casey raised his hand. Has anyone noticed how frequent the power cuts have been as of late? It’s 4AM and I’ve been sitting in the dark for the past five hours, glaring at the ceiling (which I couldn’t really make out in the dark). I can’t think of a more depressing way of spending ones Friday night, especially when I had lots of work lined up for tonight. It’s rather weird to look at a whole coast completely darkened out. From Bebek to Ortakoy, not a single house had power. The only thing you could see was the occasional glow of a candle lit somewhere amongst the darkness. I’ll stop before I start sounding too depressing. Could the power cuts have anything to do with the water restrictions? At the start of summer, the media launched a count down as to when we’d be left with no water at all. Last time I checked it was 20 days and that was a month ago. I had a shower this morning? I don’t really know where the press get their facts or if the recent rains have helped us with our impending water doom. It would really be nice if the municipality could stop sabotaging my peaceful nights at home by forcing me to search for candles in the middle of the night.